What a great smoke! Anyone know which stick this is? might have to buy a few more! That's THE Man O War. The original. I had my first one recently too and I agree,....great smoke. Luckily for us ccom has them on the sprint sales pretty often. I got a ten pack on the sprint sale. I Knew I wanted to try it. And I Knew if I didn't like it that plenty of forum guys did like 'em and they'd make good ammo. EDIT: I went and looked at mine and I was mistaken. I got a ten pack of the MOW "Ruination". But it was a great smoke. And watch the sprint sales for both kinds. I'm still looking to try the original. AND I was bombed an 'Armada" that I'm saving for a special occasion. And also got bombed a "Skull Crusher" too. That one sounds scary huh? skull crusher is also very good. I love them all! Nice ash Chris! Yeah... im lucky i got that pic! Two seconds after i picked it up the ash fell off! MoW is one of the few lines where I like everything I've had. Am I the only one who thinks it looks salamon shaped and is maybe the special edition? That'd have the ruination wrapper if I'm not mistaken? It is the Salamon. IMO is AJs only "Real Good" internet line. +1 - Great tasting Cigar / Line. ...It is the Salamon. IMO is AJs only "Real Good" internet line. That's a pretty bold statement. AJ has so many brands that are sold online. The only other possibility I can think of for what it is, would be the salomon of the MoW original, which was found in a salamon sampler. The difference is that one would have had a twisted cap at the end of the torpedo, sorta looks like a balloon knot, rather than the standard torpedo cap. Since you pic is clipped, I can't tell (but it looks more like the standard torpedo cap if I had to guess). The difference between the two would primarily be the wrapper, which would heavily influence taste. It was a standard torpedo cap. I've still got a ton of different sticks to try out before I buy anymore. This one is pretty close to the top of my list. When I'm in the market for purchasing more sticks ill start my diggin. noob question. What is "AJ" that's being refered to? AJ = AJ Fernandez. He is the one that blended the stick. Generally if you like something that a blender makes they have a distinct style that follows them from stick to stick. Just my op. 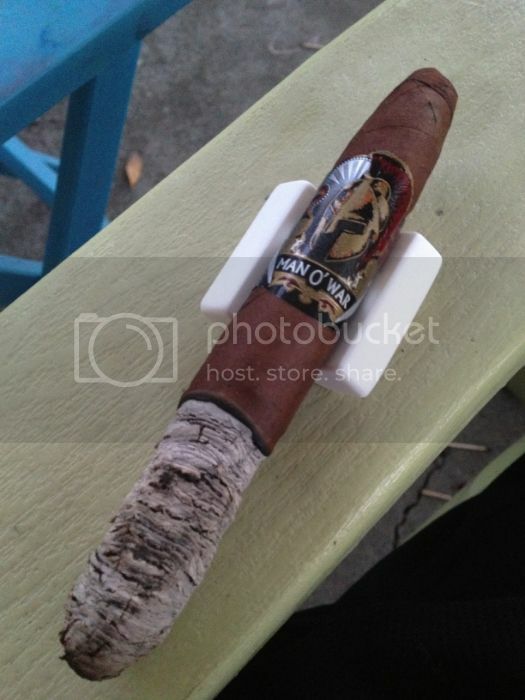 I like the San Lotano and Pinolero which I think are real good but those to me are more his b&m stuff. I think a lot of his stuff is good..just not wow real good. But again....just my opinion. Looks like the special edition figurado, personally I didn't like this blend as much as the ruination or the man o war original. They do carry a figurado, but I don't think it was in the original line up. I like MOW. No pretense with this stick. Just a well constructed, satisfying medium to full bodied, satisfying flavor. Bargain wise? Off the charts. I dig the special projects, especially the Little Devil and the Skull Crusher is very good as well.. I'm not a great big fan of the MOW Salamon. And really only think the original is just OK. But the Ruination and the PA Habano now those are fantastic. Haven yet tried the side projects. Got a couple but haven't lit em yet.